We went out to a Chinese restaurant over the weekend, and my wife found this underneath the sink in the women's bathroom. Both the kooky spelling of "clean" and the floating stars on the label suggest a double-whammy of pure, unadulterated excitement. 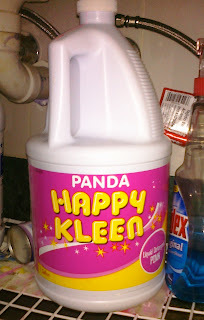 Well how the hell would YOU clean your panda? Does it banish dirt to the land of wind and ghosts?